It’s your annual conference this week. Hope you’re having fun. I’ve only been once (2007). Honestly, the whole thing frustrated me a bit and, also because it’s so expensive, I’ve not been back. My main memory was a giant, embarrassing “eh” silence after Latour’s keynote, then sitting by the river with some other PhD students wondering why no one was writing a book about “chavs” and new demonisations of the working class. But I probably shouldn’t judge on one event, and I hear you’ve changed loads recently. This year’s theme is “engaging”. I probably should be there. If I had the budget. Before I go any further, I want to say that I really, really like words. I especially like new words. I think words help us think. I think new words open new ways of seeing the world. If I wanted an army of scientific workers to do my bidding I’d train them to think politics smells bad and demonise people like Hansen. I might let them play with some light “philosophy”, certainly no sociology. A bit of the less juicy bits of Popper on a Thursday lunchtime maybe, with some workshops in business, PR and lobbying as a further “enrichment” programme. I’d probably try to enforce really hierarchical and competitive structures within science too, so the workers only talk up and down, rather than organise together. And I’d divide the curriculum up as much as possible, abstracting it all and dismantling anything that invited anyone to consider the work of scientists in any broader context. Jon Butterworth (physics Prof at UCL and another Guardian writer) very wisely replied that in such a vision he’d also ensure sociologists spoke only to each other, in obscure jargon. Moreover, I think this slightly mischievous vision might be one the sociological profession, of all areas of the academy, would both appreciate and worry about. So think on that when you next wring your hands over “dumbing down”: Who exactly are you serving with your current modes of communication? None of that means you can’t offer us new words and the new ways of seeing that go with them. I honestly think that’s one of the best things you can give. But do it well. 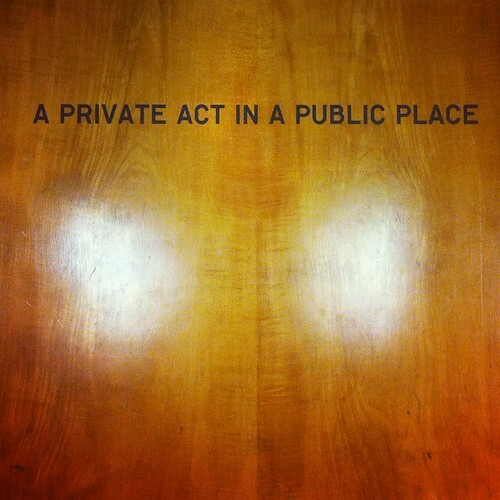 And do it with an eye on talking with (not just at) the public. I also think most of you know this already. But you do need to be a lot better. Because even people who know and love you aren’t getting it. And one of you should have already written that book about chavs back in 2007. This entry was posted in sociology and tagged sociology on April 3, 2013 by alice. UCL’s Science and Society reading group discussed an interesting paper on the production of non-knowledge, what science decides not to look at, why and how. It’s interesting because the growing literature on the sociology of ignorance – e.g. agnotology – often sees it as a problem, but as this paper points out, it’s a routine part of science. I thought I’d share my notes. You can download the paper here (pdf). Kempner, J, Merz, JF, Bosk ,CL (2011) “Forbidden Knowledge: Public Controversy and the Production of Nonknowledge”, Sociological Forum, Vol. 26, No. 3: 475-500. Historians and sociologists of science have long studied they ways in which the social world shapes the production of knowledge. But there’s a limited amount of work on what we don’t know. We might argue it’s hard to get an empirical grip on the absence of something, except that scientists are active producers of non-knowledge; they routinely make decisions about what not to do, and sociologists can track that. In many respects, a process of selection is endemic to scientific work. To quote Robert Merton, “scientific knowledge is specified ignorance” (Kempner et al, 2011: 477). What they did: 41 interviews collected 2002-3 drawn from six subject areas picked because such work might involve forms of forbidden knowledge (microbiology, neuroscience, sociology, computer science, industrial⁄organizational psychology and multidisciplinary drug and alcohol studies). Kempner et al identified the 10 top-ranked universities in each discipline and from lists of faculty, randomly chose names and backups in case they did not respond or simply refused. 30-45 mins, mainly by phone but 3 in person. The interview consisted of four sections: they asked researchers to name a prominent example of forbidden knowledge in their field; respondents were then probed on these responses and asked to comment on their own experiences as well as the experiences of their colleagues; thirdly, they asked a series of closed specific questions about practices and experiences; and finally, the interview ended with attitudinal questions about what the respondent felt about scientific freedom and social and professional constraints they worked under. In terms of the results, Kempner et al found researchers perceived science as responsible and “safe”, with scientists committed to openness and generally moral. The pursuit of knowledge was seen as worth in of itself and perhaps providing the social function of challenging social norms: ‘‘Truth and knowledge is always the most liberating thing, even though it’s often unpleasant and not what people want to hear’’; ‘‘Our job is not to defend the status quo, our job is to explore truth (Kempner et al, 2011: 484). Research subjects disagreed (70%) or disagreed somewhat (20%) that: ‘‘A journal editor should reject a paper if peer review concludes that the results would undermine or clash with societal norms’’ (Kempner et al, 2011: 486). When pushed, most of the agreed there are legitimate constraints on the production of knowledge; restrictions which provide valuable and necessary protections to society. However, they were largely dismissive of constraints on science which they understood to be motivated by electoral politics, or, as one respondent remarked, are “just typical of American Yahoo politics”. Stem-cell research stood out as an example of overly restrictive limits and the Bush Jnr era America this research was conducted in may well have been a factor. Many respondents expressed a preference that scientists themselves should determine the no-go areas for research, not policymakers or some abstract notion of ‘‘publics’’ (Kempner et al, 2011: 486). Most of the researchers were also to outline entire areas of research that they felt could/should not be conducted in their fields. Perhaps most tellingly, terms of areas which were already seen as no-go, they tended to do so by reporting stories about people who had broken norms through a series ‘‘cautionary tales’’ which amounted to a sort of gradually constructed collective memory of ‘‘what not to do’’ (Kempner et al, 2011: 486). It seemed that researchers often stumbled into forbidden territory through no intention of their own, only learning they’d hit upon some area of forbidden knowledge when legislators, news agencies, activist groups or institutional review board raised unanticipated objections. All that said, according to this data, working scientists do not shy away from controversy. If anything, they are driven by it, as long as the controversy is within the community of working scientists, not those pesky policy makers or publics. (Kempner et al, 2001: 487). Drug and alcohol researchers in particular framed the division between these two worlds using an ‘‘us versus them’’ narrative (Kempner et al, 2001: 488). Still, there were internal forces of constraint mentioned too. More than a third of the respondents reported they or one of their colleagues chose not to pursue/ publish research because they knew it contravened accepted dogmas of their discipline in some way. Overall, they concluded that “forbidden knowledge” was omnipresent in the research process, routine almost as scientific research often “requires that all working scientists learn to accept the bit so that they can properly march their paces” (Kempner et al, 2001: 494). Accepting forms of what might be called censorship is central to the everyday work of making knowledge. Kempner et al go as far to say they found it “puzzling that scientists could maintain an adherence to normative principles of free inquiry while prodigiously avoiding the production of forbidden knowledge” (Kempner et al, 2001: 496) which I found a bit unfair, or at least it’s not “puzzling” even though it’s worth pointing out and discussing. On a more normative level, as non-knowledge is such a routine part of science we should acknowledge this more. We should also perhaps try to heal that “them” vs “us” divide to build productive debate about science chooses what not to research (something I’m sure would actually liberate a lot of scientists, far from the image depicted in this paper’s interviews). This entry was posted in science, sociology and tagged censorship, science, sociology on January 31, 2013 by alice. 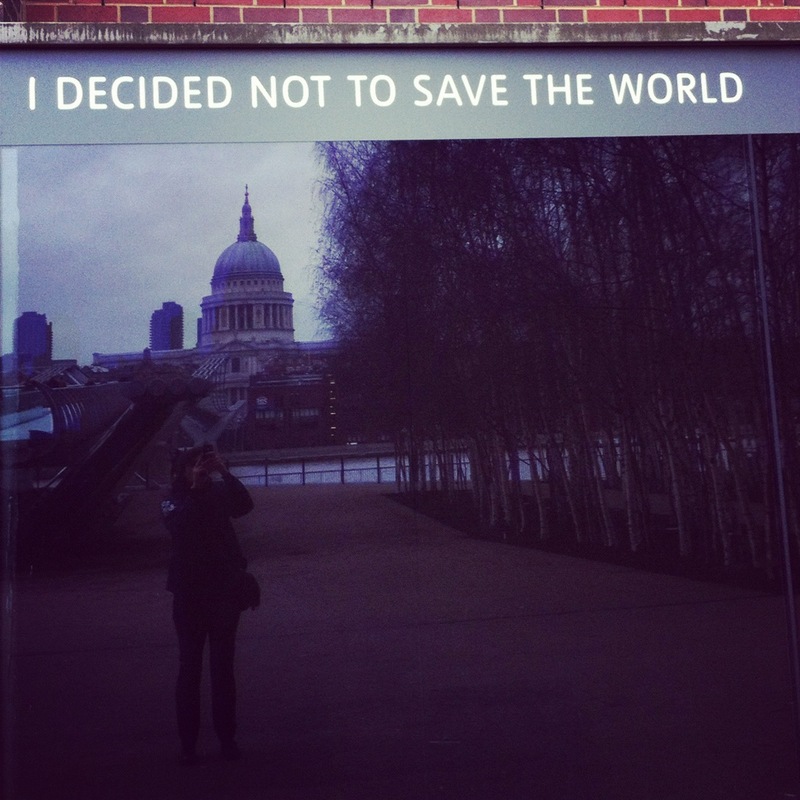 A sign outside the Natural History Museum. They’re right, we did totally invent dinosaurs. One of the many interesting things about the badger cull is the way a sense of Britishness has been utilised so much in the campaign against it. When Brian May played the closing ceremony of Olympics with pictures of a fox and badger on the sleeves of his jacket, he arguably subverted a particular idea of Britishness (the hunting and fishing type), with another (one that is more likely to privilege animal rights over sport). More plainly, there was SchNEWS’ claim the badger was the British equivalent to the panda, or Brain May (again) Kitchener style posing: Badgers need you. Personally, I’m not sure Kitchener is a form of Britishness I personally have much affinity with. May also came dangerously close to comparing himself to Mandela which seems ill advised at the best of times, but perhaps especially for a musician famous for playing apartheid South Africa. There’s been rather a lot of flagwaving around UK science this summer though, similarly ill advised in my view. First up, David Cameron’s celebration of the discovery of the Higgs boson was just plain crass. Yes, Peter Higgs is British, but the discovery was the result of many people working together, drawing on the resources and expertise of even more. That sort of visionary mass action of human is what we should be celebrating, not way hays for British bosons. Indeed, that’s kind of why CERN exists: to draw on and develop science’s large networks of international collaboration. The Department for Business, Innovation and Skills use of the “Britain is GREAT” campaign has been bugging me for months (see pictures above and below, and more in this post, there was also an exhibition at the Science Museum). 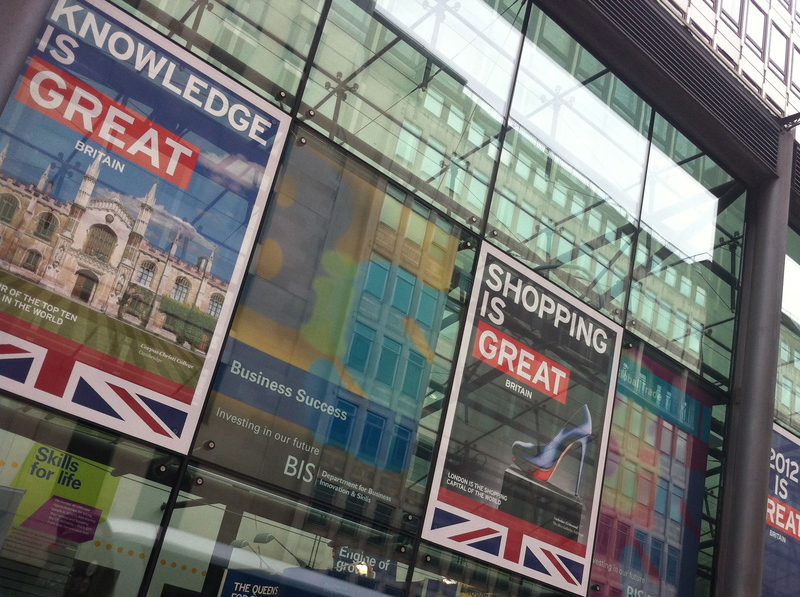 Considering the recent changes to higher education funding in the UK, I was especially taken by the “knowledge is GREAT” posters, complete with nod to the lofty spires of the UK’s famous universities, next to those proclaiming “shopping is GREAT”. As several people have pointed out – e.g. Mariana Mazzucato – for all the campaign’s rhetoric in British innovation, this wasn’t accompanied by as much visionary, bold public investment as there could be. Knowledge is so GREAT, wish they’d invest in it. Outside BIS earlier this year. 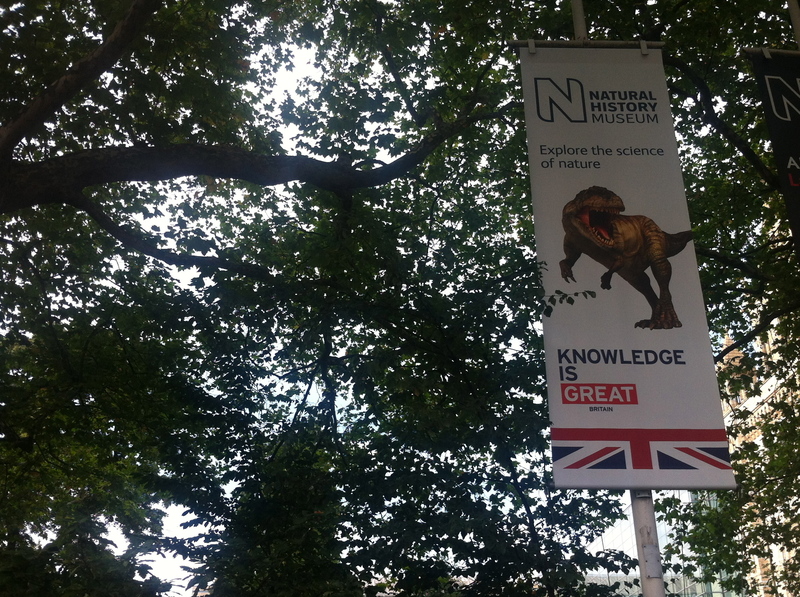 In many ways, that Natural History Museum poster is right though, we did totally invent the dinosaur. Or at least the word dinosaur was coined by the Natural History Museum’s founder, Richard Owen. Britain has great scientific and technological heritage. It was lovely – refreshing even – to see it featured in the Olympic and Paralympic ceremonies. I like that our money has Stephenson’s rocket and Watson and Crick’s helix on it. I don’t want to argue that science lacks any local identity or localities won’t be proud of their scientific and technological heritage. There are many types and stories of Britishness though. “We” didn’t invent dinosaurs, Richard Owen coined the term, and I don’t feel much affinity with him, even if we did work in the same bit of London. By most accounts, he wasn’t the nicest of people. He also died many decades before I was born. I also personally feel a bit alienated by the poshness of the Royal Society, Royal Institution et al. It’s not a culture I feel part of. There’s a colonial history surrounding science and technology which we should be aware and critical of too, and we should be careful of the negative impact a blinkered immigration policy can have on the complex multi-cultural networks of modern science. I’m not a fan of nationalism at the best of times and I admit to suffering from a bout of bunting fatigue after our summer of Jubilee/Olympics, but I really wish everyone would put those bloody flags away. Or a least show some more awareness of the way a sense of Britishness may exclude and limit as well as include and celebrate. EDIT: as Tori Herridge suggests, there are connections to this and some of the recent chatter about the appropriateness of celebrating heroes in science. See, for example, Athene Donald on the topic (and piece I wrote for the Guardian last weekend, which also referred to Cameron’s Higgs gaff). Summer is over. 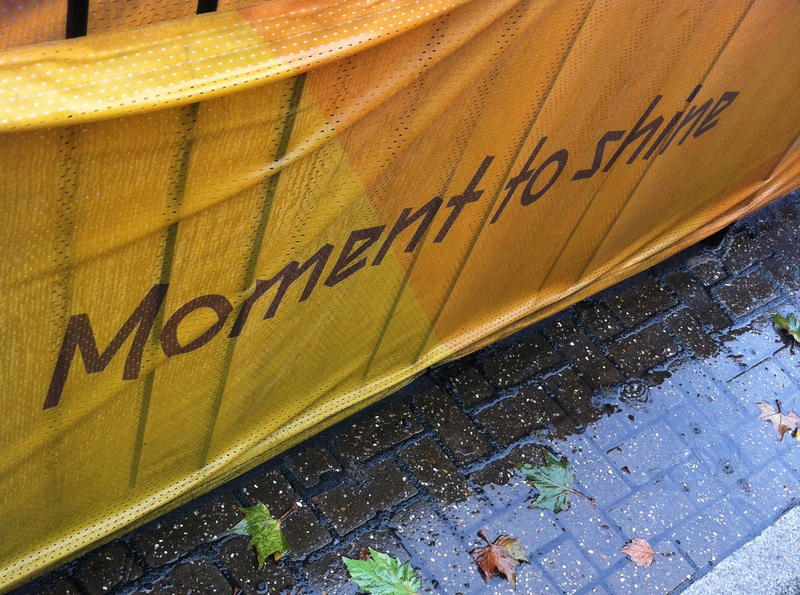 Damp “time to shine” banner in Autumn rain outside Turnpike Lane tube. Some of the above is based on something I wrote for the first edition of the new UK edition of Popular Science. The magazine’s been published in the US since 1872, so for a British version I thought I’d have a bit of a poke at the idea of celebrating Britishness in the popularisation of science. If you want to read the full piece, the bad news is the magazine is iPad only. If that hasn’t lost you, the good news is that the first edition is free. This link should take you to the right bit of iTunes. This entry was posted in science and tagged nationalism, popular science, science, sociology on October 5, 2012 by alice. 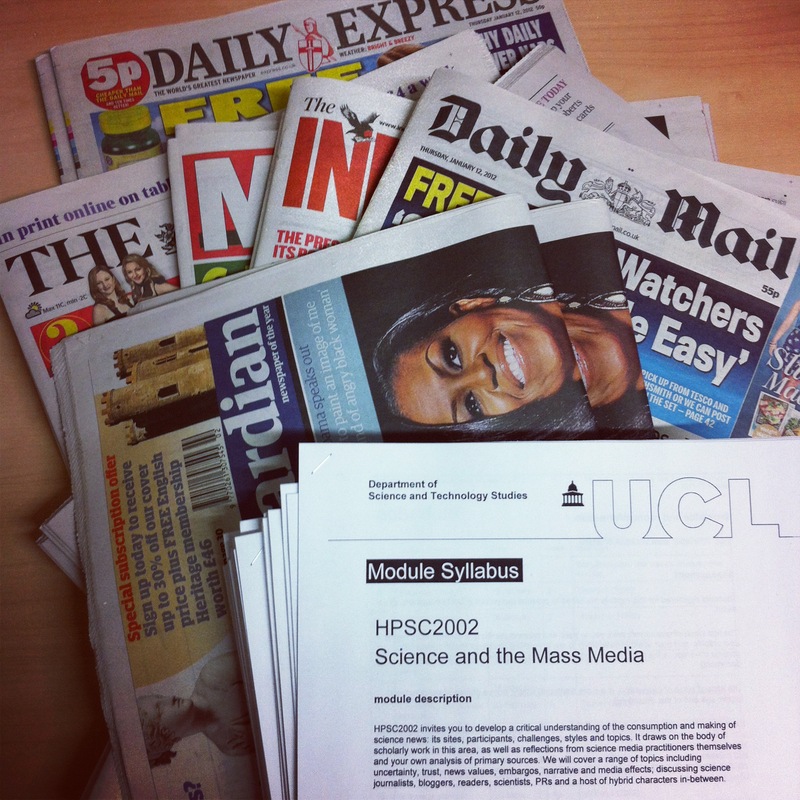 I’m working a day a week at UCL this term, teaching the ‘Science and the Mass Media’ course in the Department of Science and Technology Studies. Nosey people can see the full syllabus here (pdf). Or, if you want to play along at home, I’ve pasted some of the essay questions below. A couple of thousand words due by the end of term. No, I won’t mark your answers (unless you are actually registered on the course, obviously, in which case I am very much looking forward to reading your work). 1. In early 2010, an expert group working on behalf of the Department of Business, Innovation and Skills published a report entitled “Science and the Media: Securing the Future”. To what extent do you believe this report reflects what Steven Hiltgartner, writing in 1990, described as the then “dominant concern” of popular science? Has anything changed in approaches to science in the mass media over the last 20 years? 2. Have the roles of science journalist and PR officer blurred too much in recent years? 3. Last year, the UK’s chief scientist Sir John Beddington was reported as saying: “We are grossly intolerant, and properly so, of racism. We are grossly intolerant, and properly so, of people who [are] anti-homosexuality… We are not – and I genuinely think we should think about how we do this – grossly intolerant of pseudo-science.” Do you agree that such gross intolerance is the correct approach to take here, or are there alternatives? 4. Are bloggers the new science journalists? 5. To what extent can an NGO do effective science communication? Is the case different for environmental campaigning groups compared to medical charities? 6. John Rennie, a former editor of Scientific American, recently argued against what he calls the “big paper of the week” approach to science journalism. He went on to suggest an experiment where everyone agreed not to write about research until six months after publication. Do you agree that a focus on the publication of papers is a bad approach to reporting science? Should journalists wait six months, as Rennie suggests, and/ or write about science pre-publication? 7. What is the ‘inverted pyramid’ of news reporting, and how are science writers using online tools to re-invent science storytelling? 8. How might we go about studying the representation of women in science media? Your answer should discuss both possible research questions and methods for analysis, referring to the body of work already undertaken in this subject. This entry was posted in teaching and tagged history of science, journalism, media, media studies, policy, sociology on January 13, 2012 by alice. 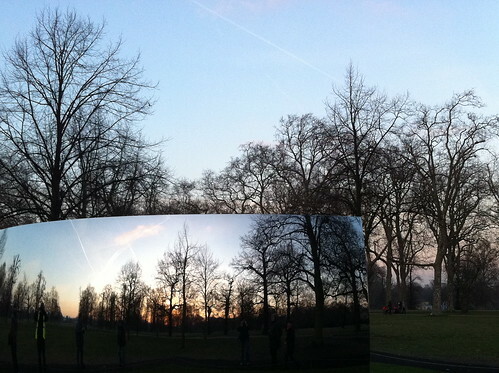 Anish Kapoor sculpture in Kensington Gardens earlier this year. I want to use this post to argue for the idea of the communication of science as a sort of public advocacy for natural objects. That probably sounds more complex than it should. In many ways, all I mean is that I think we can think of people who share scientific ideas as telling stories about nature. I think hearing stories about nature is important. Science looks at things we wouldn’t otherwise see, and in ways we wouldn’t normally try; it shows us something new about the world. As some sociologists of science might put it, science’s networks of ideas, machines, methods and prior knowledge ‘transcribe’ new views of nature for us. Science uncovers stuff. That’s why we invest in it. These new views can also be politically important, or personally useful. Glaciers make for a good example. Or the impact of particular drugs on bits of our bodies. Take glaciers: I’ve never touched or smelt one. I’ve seen them, but only ever mediated through photographs or film. I trust that they exist, though maybe that’s terribly credulous of me. I also trust things like the BBC’s Frozen Planet or Nature News’ special on the Arctic (though maybe less unquestioningly). I also appreciate them because I think it’s important to know about these big, cold, possibly-slightly-melty objects so many miles away from me because I also believe that I inhabit a world within which they also exist and am willing to believe that my actions may have an impact on them and they, one day, may impact upon me too. I like that reports like this keep me informed with information, but also because they remind me to think about objects like glaciers because, honestly, I’m a busy girl-about-town liable to get distracted by a passing pigeon/ NHS policy/ knitting patten. So, when Suzanne Goldenberg writes something like ‘It’s an odd sensation to watch a glacier die‘ she speaks up for the existence of the glacier and reminds me to think about it. Writers about more abstract science bring even less tangible natural objects to attention, as well as telling us about them: holes in the ozone layer, neurons, genes, quasicrystals. In a way, they bring them into public existence. (People who communicate social science do similar work too, showing us stuff I suppose is there right in front of us, but without experts to take time, methods and sometimes even equipment to study, we wouldn’t necessarily notice. Isotype‘s visualizations of society en mass, as opposed to via individual perception, provide some good examples of this). This might sound like a rather old fashioned view of science writing. Maybe it is. But it’s not born from a desire to go back to a golden age. The slightly clunky phrase ‘public advocacy of natural objects’ is deliberate, as I don’t come to this innocently assuming that science just tells you stuff to listen to. I am aware of the layers of belief involved here, and the degrees of uncertainty. I also think coping with a bit of belief and uncertainty is necessary to understand, predict and cope with life in the complex world we inhabit. I think science provides a point of view on the world which for all it’s faults aims to be the best which humans have, and can be a view worth sharing. As such, we might see some aspects of science communication as a form of public argument. It’s rhetoric (and that’s ok). I’d expect an advocate to go in ready to debate, ready to answer and provoke questions, not simply present a view, and to say a bit about how they know, as well as what. Maybe ‘advocate’ is the wrong word though: too political, more the role for campaigners? (Or maybe science communication should accept a campaigning role?). I should probably say something as to why I’d bother even suggesting this idea in the first place. For a while, I’ve been a bit frustrated by rather dichotomous way many people tend to think about science communication: deficit or dialogue (read this ‘where now’ bit in this post if you want to know what that jargon means). I don’t want to argue against the critique of the deficit model or necessarily against public dialogue, much of which I see as A Good Thing. Neither do I want to retreat to an idea that before we have public engagement we must have public understanding (quite the opposite, if anything). I just think it’s limiting as a way of thinking. It also feels a bit like a 20th Century fight, and that we shouldn’t always be trying to foster debate about science. Anyway, happy to admit this is a half-baked idea dreamt up on a bus ride to the pub which is probably totally wrong-headed. I’d love to hear what other people think though, I’m interested to know if I’m wrong in an interesting way. This entry was posted in engagement, policy, science and tagged books, engagement, policy, science, sociology on October 13, 2011 by alice.